Rio Salado College | RioNews: Congratulations 2017 AACE Grads! A big shout out to Rio Salado's 2017 Adults Achieving a College Education (AACE) graduates! Photos of the Completion Ceremony can be found on our Facebook page. Feel free to share and tag. The AACE program is designed to help students transition seamlessly to college—while they are completing their High School Equivalency GED® test preparation program and English Language Acquisition for Adults classes at Rio Salado. The program helps students improve their academic skills in math, reading and English so they are prepared to take college level courses. Here is what some of the graduates have to say about the AACE program and how it helped them. 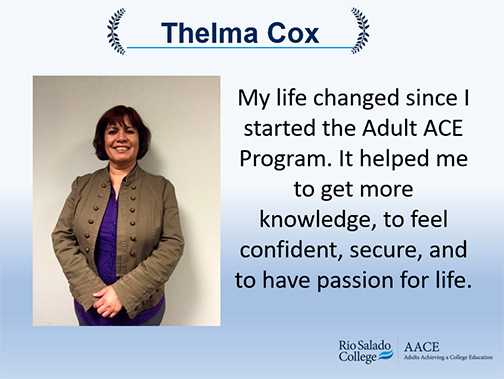 To learn more about Rio Salado’s AACE program contact Kate Packer at adult.ace@riosalado.edu. Rio Salado College serves as the principal provider of GED® test preparation programs for the Maricopa Community Colleges and the largest provider of adult basic education in the state of Arizona. Visit this web page for additional details.